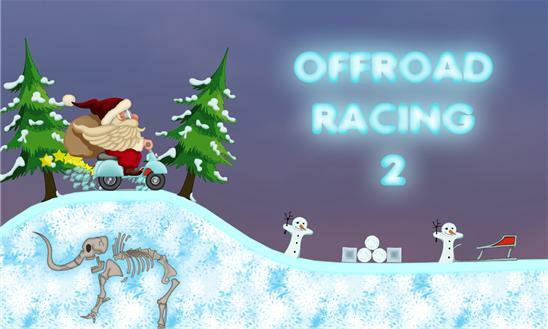 Offroad Racing, the popular physics based racing game with over 2 million players worldwide is back with a free action-packed sequel. Combining beautiful HD graphics, realistic physics and easy-to-use controls, Offroad Racing 2 is a unique and fun driving game for all ages. Unlock and upgrade a variety of vehicles, from fast racing cars to furious monster trucks. Test your skills in different game modes on 7 gorgeous level packs with more than 100 increasing difficulty levels. Collect coins and spend your reward on vehicle upgrades in the garage. Perform stunts to earn extra coins. 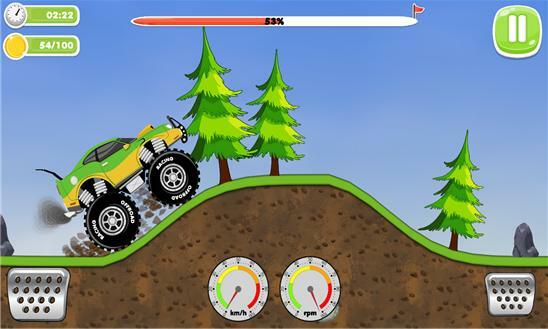 With loads of exciting and tricky levels, Offroad Racing 2 provides you endless hours of fun. There is only one rule in this adventurous world in addition to the laws of physics: don't crash your vehicle! Are you ready for this gravity defying experience? Bonus content: Help Santa Claus deliver the gifts in time on his special turbo scooter. And remember, he is always in a hurry at Christmas Eve! Features: - Beautiful HD graphics at 60 FPS - Entertaining and realistic physics - 6 cool unique vehicles to master - Vehicle upgrades (Engine, Suspension, Tires, Control) - 7 different level packs (Hills, Arctic, Mars, Desert, Candy Land 1-3) - 100+ challenging levels - Leaderboards and lots of achievements - Daily coin bonuses and in-game shop _____________________________________________ Visit our official site at http://www.obumogames.com Like us on Facebook at https://www.facebook.com/obumogames Follow us on Twitter at https://twitter.com/ObumoGames Check out our videos at https://www.youtube.com/obumogames +1 us on Google Plus at https://plus.google.com/+ObumogamesEnterprise v1.1 November 28, 2014. - Fixed level balancing issues. - Minor bug fixes and UI improvements. v1.0 November 21, 2014. - Initial release of the game.